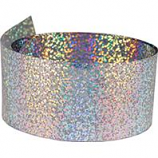 Iridescent holographic bird repelling ribbon. Simple to install. 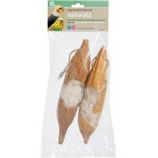 Hang or tie wherever pest birds roost nest or create problems. Use for pigeons sparrows starlings crows blackbirds grackles seagulls swallows woodpeckers ducks geese and more. Ideal for yards gardens rooftops parks ponds boat docks private beaches patios balconies and any open outdoor area. Easy to hang or set in problems areas. 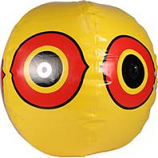 Confuses and frightens birds with lifelike reflective predator eyes. Ideal for use in trees overhangs gazebos patios house eaves boats and even in pools. Extremely versatile. .
• 15 Dome Acts As A Rain Guard. Uv Stabilized Polycarbonate Prevents Yellowing. Safety Lock Hook Secures Feeder. • Articulating Design Weight Of A Squirrel Displaces Feeder Hung Beneath. 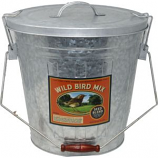 • Effective Over Any Hanging Feeder.